At the end of May 2004 Apple’s organization underwent a major shakeup. Three years after the introduction of its digital player, the Cupertino company created a new iPod division. 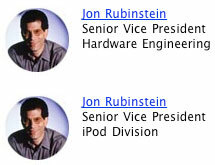 Jon Rubinstein was appointed Head and his role changed from “Senior Vice President of Hardware Engineering” to the new “Senior Vice President iPod Division”. The rest of Apple’s activities at the time were redirected into the Macintosh Division, with Timothy Cook at the helm. Although Cook’s role was widened, his formal status didn’t change, at least according to the Executives Profiles page on the Apple website where he kept the old title of “Executive Vice President of Worldwide Sales and Operations”. The reorganization reflected the growing importance of the iPod at Infinite Loop, in particular after the introduction of the enormously successful iPod mini.